If you’re like many Americans, you feel frustrated with your overpriced cable contract and are looking for how to watch TBS without cable as well as your other favorite networks without cable. Despite so many channels, it often feels like there’s nothing worth watching. There may be a few networks, like TBS or USA, with shows you regularly tune in to watch, but beyond that you find yourself aimlessly flipping through an endless list of uninteresting channels. Personally, I’m not a fan of popular shows on TBS like The Last OG, American Dad, Conan, The Guest Book, and Wrecked. However, I know many are and would like to find a way to stream TBS free or at least watch TBS without cable. 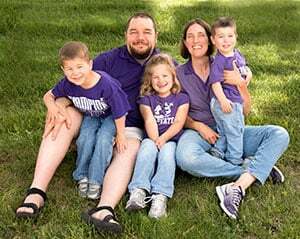 Are you looking for a way to cut your expenses so you can free up some money in your budget? Cutting the cord on your cable contract is one of the easiest and most effective ways to do it. 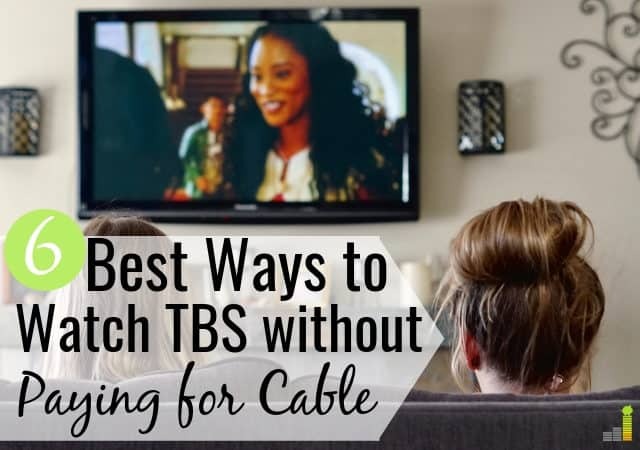 If you’ve been asking, ‘how can I watch TBS without cable?’ you’ll be glad to know there are a number of great options that don’t require paying for cable. The abundance of streaming services now on the market make it possible to enjoy your favorite sports, entertainment, and lifestyle programming for a fraction of the cost of cable TV. Our family used to pay $110 per month for our DirecTV contract. Since cancelling our subscription a few years ago, we’ve saved over $80 per month and can still watch ESPN, HGTV, History Channel and our other favorite live events and shows. If you’re ready to cut the cord and want to know how to watch TBS without cable, here are a few of the best ways to stream TBS online. We’ve been enjoying Hulu with Live TV for the past three months and love it. We added Hulu with Live TV so that we could watch our favorite college football team’s games for the season. The beauty of Hulu Live is that you can move down to legacy Hulu for only $5.99 per month and back up to Hulu Live for $44.99 per month whenever you want. Either service is a great way to watch TBS without cable, but having Hulu Live gets you TBS live stream, which includes the MLB playoffs. It also lets you watch hot shows like Snoop Dogg’s new series, The Joker’s Wild and episodes of old favorites like Friends, Family Guy, and Seinfeld. Hulu Live’s TV channel lineup is part of what makes it one of the best alternatives to cable TV available. If want to get TBS without cable, Hulu Live is an easy way to do it. Learn more about Hulu Live by reading our Hulu with Live TV review. Or if you’re ready to give it a shot, try Hulu Live for free for 7 days now. Another great way to watch TBS without cable is Sling TV. A mature platform, Sling has worked the kinks out of its streaming service and delivers an enjoyable experience for an affordable rate of only $25 per month. Sling TV delivers its channel lineup in two packages – Sling Blue and Sling Orange – both for $25 per month. You can watch TBS without cable through either package. There are a few differences between Sling Orange and Sling Blue, but watching TBS without cable is not one of them. Sling Orange delivers 30 channels, including ESPN while Sling Blue offers 42 channels without ESPN. While there is some overlap, the main difference between the two options is access to ESPN. You can tailor your channels and DVR capability with add-ons that run $5 to $10 per month. Sling TV is a low cost cable alternative and a great answer to the question of how to watch TBS without cable. Like Hulu Live, you can get Sling TV free for 7 days. Learn more about the channels, platform, positives and negatives of Sling TV in our Sling TV review now. DirecTV Now is one way to watch TBS without cable. 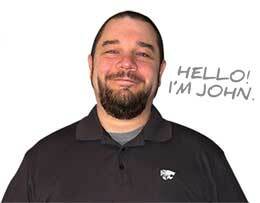 Their base plan gives you unlimited access to TBS live stream for $50 per month. While the price tag is a bit higher than other streaming services, you do get more than 60 channels without a contract. That’s still a savings of more than $70 off the average cable bill. You can learn more about the various packages, streaming quality and channel guide in our DirecTV Now review. PlayStation Vue is an excellent way to watch sports without cable. Still, it offers a full channel list of popular entertainment, lifestyle, news, and family content too. Some people are surprised when they discover that a PlayStation console is not necessary to watch TBS without cable. You can consume all of PlayStation Vue’s content on your laptop, tablet, desktop, smartphone or smart TV. All you need to get TBS without cable is an Internet connection and a streaming device, which could be as basic as your web browser. As with the other options already mentioned here, you can try PlayStation Vue for free for 7 days to see if you like it before cutting the cord on your cable subscription. If you’re searching for the best way to watch TBS without cable, YouTube TV is worth considering. Like all of the streaming services mentioned here, YouTube TV has no contract and no cancellation fees. A subscription runs $40 per month and includes more than 50 channels like ESPN, ESPN2, ESPN News, and USA Network. You can watch TBS for free with YouTube TV’s free trial and see if this streaming service is a fit for you and your family. Can I Stream TBS Free? Lots of people ask how to watch TBS live stream online free; unfortunately, there’s no way to watch TBS live stream online free. While TBS does have a live stream app, the only way to stream TBS free or watch the TBS live stream free is with a key code from a cable provider. Are you paying too much for cable? Save big now by switching to Hulu With Live TV! Get 60+ channels, DVR, locals, ESPN, HGTV, Disney, CNN, Fox News and more for only $39.99/month. Get your 7-day free trial now! You can try using a login from your Internet Service Provider (ISP), but there is not guarantee that it will work. When you think about it, if a cable subscription is required to stream TBS free, the TBS live stream really isn’t free. It’s costing you around $110 per month. The best way to watch TBS online without cable is with one of the streaming services mentioned here. Maybe you don’t watch enough TV to warrant a subscription to Hulu Live or Sling TV but there are a few shows on TBS you just can’t live without. If that is the case, you can watch TBS online free without cable by simply purchasing episodes of your favorite TBS shows. You can buy entire seasons of your favorite shows from Amazon, iTunes, or another similar service, which may be a cheaper option than signing up for a streaming service. On Amazon, for example, you can enjoy an entire season of your favorite TBS show for just $19.99. Some TBS shows may be available on Netflix and there are a few episodes available at no cost on the TBS app on Amazon Fire TV and the Amazon Fire TV Stick. However, if there’s more than one TBS show you want to watch without cable, a cheaper streaming service, like Sling TV, may make the most sense for you. Can I Watch TBS on Apple TV, Chromecast, Fire TV, or Roku? All of the main streaming services including Hulu Live, Sling TV and more, have apps on AppleTV, Roku, Amazon Fire TV and Chromecast. Basically, if you have an Internet connection and a streaming platform, you’re set with any of the major streaming services. Heck, we watch Hulu Live on our laptops and smartphones. We just type Hulu.com into our web browser or open the Hulu app on our phones and we’re good to go. 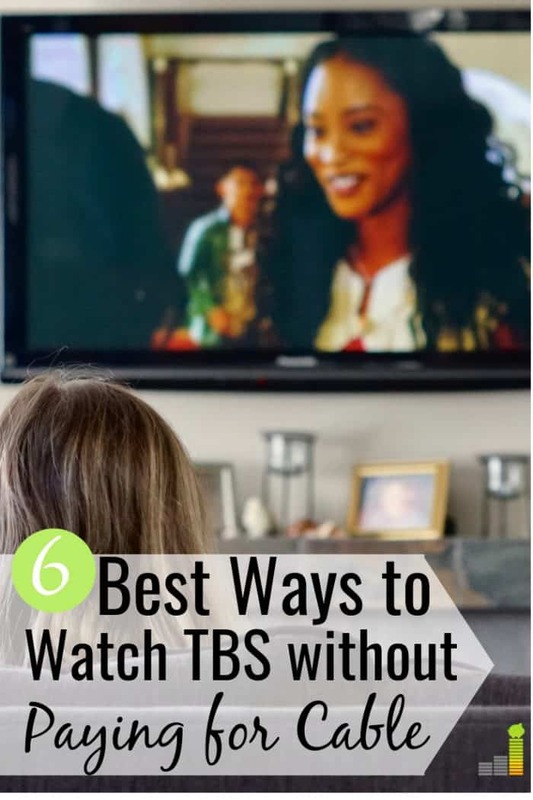 If this post shows anything, it proves that there are many different ways to watch TBS without cable on the streaming platform of your choice. With so many affordable choices, is there any good reason not to cut the cord? The average American spends $110 per month on cable TV. If watching TBS is keeping you in your cable contract, there are cheaper ways to get it. Hulu Live and Sling TV are two great streaming options. Try one of the streaming services mentioned here today and start saving money right away. Just think of what you could do with an extra $70 per month. How do you watch TBS without cable? What other channels keep you from cutting the cord? How much money do you spend on cable or cable alternatives each month?